ArchitectureCraft provides a wide variety of good-looking architectural features including sloped roofs, glazable window frames, arches and other rounded blocks, classical pillars and entablatures, and railings for balconies and stairways. ArchitectureCraft blocks may be made from almost any vanilla material and many materials added by mods as well. How do you use cladding? I love this mod, cool as hell! Especially neat that it uses existing blocks (and their textures) to create the new blocks. So the new blocks already match with any resource pack. Would love it if the cladding pieces could be applied to any of the new blocks and not just the roofs. I'd like to use a cheap material to make the shape and clad it with an expensive finish layer. I'm a Chinese player, this mod helps me a lot, i just want to say thank you!!! Can you plz make an update for Minecraft 1.12.1/2? 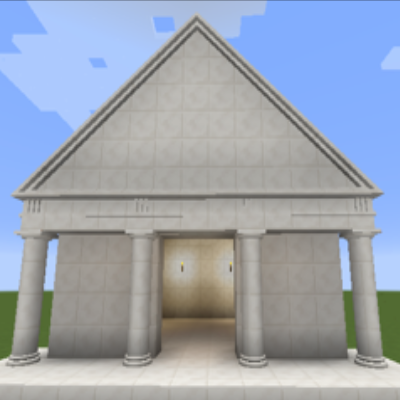 https://minecraft.curseforge.com/projects/architecturecraft-elytradev?gameCategorySlug=mc-mods&amp;projectID=277631 - port to new versions. Very good mod guys. I use frames and stair rails instead fence)) . But i really need corner for all cylinder blocks, cuz i imitate pipe with them and without it looks not good. Yes , ArchitectureCraft is avaible for 1.12.2 MC and can work. Are there update (i prefer) or core which might ensure a best render about curves, bevels, chamfers, triangle, ... ? Amazing mod! Would it be possible to allow the use of cladding in window frames, to fill the inside of the window? That way, it would be possible to use mod blocks for the glass. Is anybody else seeing a large FPS hit when placing blocks near to Architecturecraft blocks, particularly when working near to railings? Further information: It seems to me that the problem particularly affects the ornate railings, and possibly has something to do with lighting calculations. My best guess about what is happening is that lighting on ornate railings is time-consuming, and is being recalculated for each individual railing block every time a block is broken or placed within a certain distance horizontally or a smaller (or so it seems) distance vertically, even if there is no line of sight to the railing from where the block is placed/broken. I've confirmed that the problem is SPECIFICALLY the Fancy Balustrade. Frustrated with the level of lag, I started removing all of the fancy balustrades from my manse, and the block place/break lag progressively decreased as I removed more balustrades. By the time I had removed almost all of the balustrades, the lag was almost completely gone. The plain balustrades do not seem to have nearly the same effect. I'm going to guess that the problem is that calculating lighting on the complex curves of the fancy balustrages gives Minecraft conniption fits. If there's just a few, it's not a problem. But if you use a lot of fancy balustrades, the lighting calculation lag will kill you. I had hundreds of pieces, on four balconies, three overlooks and six staircases, and the lag was crippling. Thank you for your effort! I know no one else replied but it was very cool of you to go through the trouble of figuring it out. It is appreciated!